June’s education program will look at how we assimilate non-English speaking newcomers into our country. We’ll hear from experts and volunteers who help these families navigate language and cultural barriers while seeking medical help, legal advice, family social services and education. St. Phillips Episcopal Church, 730 Bestgate Road. CASA (Court Appointed Special Advocates) volunteers are here to ensure the safety and well-being of the most vulnerable children who have been abused, neglected or abandoned in our community. The CASA organization, a non-profit supported by an AAWGT grant, recruits, screens, trains and supports these community volunteers, who will represent foster children in court and throughout their time in the foster care system -- with a goal of finding them a safe, permanent, loving place to call home. Aziah was one of nine siblings placed in foster care after being pulled from their home due to severe neglect and abuse. His heart-breaking story is a long-and-winding-road that has a happy ending. 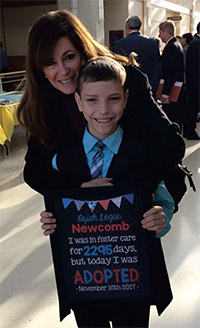 His early life, and his former foster home experiences, resulted in him developing some fundamental learning disabilities, anger outbursts, and manipulative behavior problems. With the help of his adopted parents’ guidance, his CASA’s support, and anger management and trauma therapy, he is making great progress. He has now turned his grades from failing to honors, he has begun to thrive in life, and he is making new friends. He also is a wonderful big brother to his baby sister who was adopted in March. Go Grrrls, a program funded by AAWGT at Arundel Lodge, is designed to address the risks and challenges that early adolescent girls face, and to promote positive development. The group is held within a healing, therapeutic environment to address participants’ social, emotional, and mental health needs. 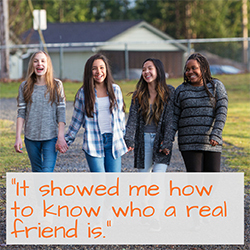 Using discussion, games, and visual and expressive arts, the group explores a variety of topics such as communication, media messages, gender roles, body image, assertiveness, problem solving, friendship, self-esteem, and planning for the future. Six of the nine group members were present for both a pre-test and post-test. The results of this questionnaire show a 50% decrease in feelings of hopelessness, 67% improvement in body image, 67% improvement in self-esteem specific to peer relationships, and 100% improvement in overall self-esteem. Several of the girls who took the questionnaire and whose score “stayed the same,” showing no significant improvement in some of the categories, scored high on the pre-test to begin with. The spring session of Go Grrrls began on March 1. Participants were identified from among current Arundel Lodge clients, local middle schools, Anne Arundel County Department of Social Services, and various community members. Now having awarded the 2018 grants, we have raised and granted $1 Million!! The Giving Circle is now in its 12th year, and our more than 200 members voted on May 9th to decide which non-profits will receive the 2018 grants totaling more than $100,000. (We'll be sending an announcement out soon.) That is collaborative giving. Once again we will be fulfilling our mission to support initiatives that improve the quality of life for women and families in our county. All together, we have awarded more than 80 grants! For our new members, first of all, welcome! Here’s a brief history. A group of women decided in 2006 to join together and use their philanthropic dollars to further their commitment to causes. Collective giving would have the kind of impact they sought. Several of our Founders were at the Spring Open house on April 11 at London Towne and Garden. Those Founders decided on a mission, which we still adhere to today. Our pooled dollars are granted to organizations that serve women and families in the areas of health and welfare, education, and prevention of and treatment for violence and abuse. AAWGT is a fund of the Community Foundation of Anne Arundel County, which means they manage our money and give us all kinds of support. At our events and meetings, you can look around you and see accomplished, committed, and collaborative women who, as we say, come for the philanthropy and stay for the community. We find that inspiring, and hope you do, too! International Women’s Day is a time to reflect on progress made, to call for continued change and to celebrate acts of courage and determination by ordinary women who have played a role in the history of their countries and communities. This year’s March 8 AAWGT event, “Women on the March,” came on the heels of unprecedented national and global movement for women’s rights. Every March we hold a Women & Leadership event with inspiring women speaking about how they lead change. The most effective, lasting change happens through local efforts, but hearing from someone leading that change nationally makes us realize that we’re part of a larger movement to make the world a better place for women and their families. This year the focus was voting rights. Main speaker Angela Dodson, author of “Remember the Ladies: Celebrating Those Who Fought for Freedom at the Ballot Box,” discussed her book about the women’s suffrage movement in the U.S. and women’s political gains up to the present. Ashley Oleson, Administrative Director for the League of Women Voters of Maryland, talked about the League’s work, emphasizing that women’s most important right is to vote. And Carol Richards, a longtime journalist now teaching at George Washington University, moderated the discussion. Topics discussed were the effect of gerrymandering on steering elections toward specific parties, how the “MeToo” movement is creating momentum among women voters, and specific advocacy that AAWGT members might engage in. An overall takeaway from the program, attended by more than 100, was that we’ve made progress but there’s still work to be done to get us to the full potential of equality. Here is a link to the video in case you missed it.